Now you can dry your pet's hair with ease using our innovative and highly engineered pet grooming blower. Ideal for drying your small, medium or large pet's fur, our dog blow dryers are small in size with a convenient handle and feature various wind speed and temperatures to choose from. With innovative noise reduction features, this quiet dog hair dryer is ideal for pets who are easily startled by the noise from traditional dryers. Once you try one of these pet dryers, you won't believe how long you struggled without one! Why Should We Blow Dry Our Pets? Blow drying your pet with a pet grooming dryer hair until its coat is all the way "bone" dry will make it look its best. The hair will be straight, fluffy, and clean. Poodles look more professional when blow dried while other breeds look full of body. With CE safety certification, US standard voltage AC110V, our pet hair dryers provide you a professional pet care right in the comfort of your home. Flexible Hose: 27 to 83 inches in length adjustable. POWERFUL BLOW DRYER FOR DOGS AND PETS -Dry your pet with ease using our dog grooming hair dryer. Perfect for drying your pet's fur, this dog hair blow dryer is small in size with a convenient handle. Pick from 4 nozzles, made from high quality PU rather than standard inferior PE or PVC material. Lightweight and easy to use, the pet safe hair dryer is perfect to use at home or even commercially. PET GROOMING BLOW DRYER FEATURING STEPLESS ADJUSTABLE AIR FLOW SPEED- Our grooming hair dryer for dogs feature a full range of speed settings allowing you to adjust accordingly to the pet you are drying. Stepless speed allows professional groomers to work at full speed for efficient drying of larger animals or rapidly dial down the airflow for small or sensitive dogs. 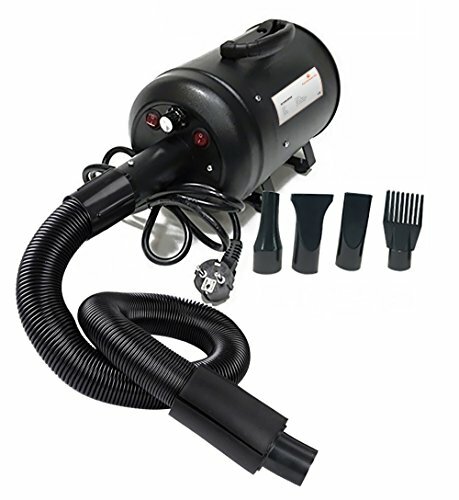 PROFESSIONAL DOG HAIR DRYER DRIES YOUR PET 2 X FASTER THAN STANDARD DRYERS- The 1040g blow force of this dog hair blower dryer is 5 times stronger than similar dryers on the market while it's 2.9-3.2m3/min air flow is 10% greater than other single-stage dryers, helping to remove water from the fur efficiently. According to scientists, 2800W is the perfect power to dry a pet, as it can blow water, dirt, debris, etc efficiently from fur. QUIET HAIR DRYER FOR DOGS OF ALL SIZES AND SENSITIVITIES- Looking for the best dog hair dryer for your small, medium or large pet who may be sensitive to noise or nervous around grooming? This electric pet hair dryer features innovative noise reduction devices at air inlets to ensure pets' security. The silencing cover helps reduce noise by 10% while the external filter has been specially designed for noise reductions. DURABLE BLOW DRYER FOR PETS WITH UNIQUE BUILT-IN HEATER- The Pet Control HQ dog hair dryers come with an innovative built in heater not found in other dryers on the market! Other dog hair dryers available don't have the in built heater device, but only use the heat generated by the motor, which is not optimal. Ours is also the only pet groomer blow dryer on the market to feature a fully metal cover and body! If you have any questions about this product by Pet Control HQ, contact us by completing and submitting the form below. If you are looking for a specif part number, please include it with your message.